Investigators: W. Chutipong, N. Tantipisanuh, D. Ngoprasert, G. A. Gale, D. H. Reed, A. J. Lynam, N. Bhumpakphan, V. Chimchome, R. Sukmasuang, Y. Trisurat, and J. W. Duckworth. 2010. 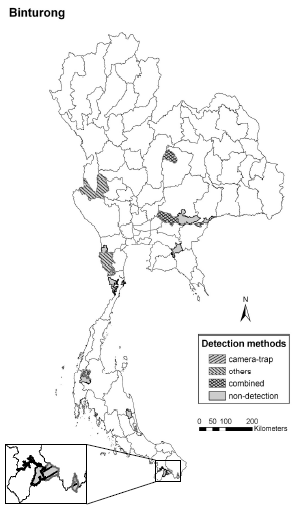 Following the Clouded Leopard and Small Felid Summit held in Bangkok in January 2009, a group of researchers became interested in the the metadata that had been gathered from photo-trapping in Thailand. A group analysis would allow the researchers to understand wide-scale population trends better than they could on their own as well as let the researchers assess the quality of their survey methods and discuss ways of improvement and standardization. In addition to improving their own techniques, it was also hoped that this might also raise awareness of Thai conservation needs and also help integrate Thai conservation projects with those of neighboring countries of Laos and Myanmar. 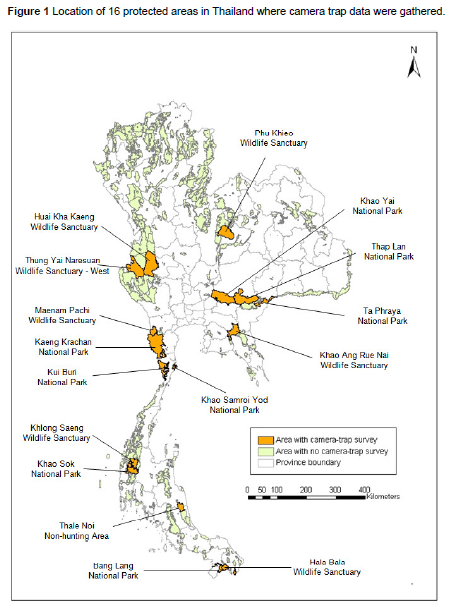 In November 2009, an international workshop was held, bringing together forty individuals with relevant field-collected datasets and recent photo-trapping experience to review the current status of small carnivores in Thailand. 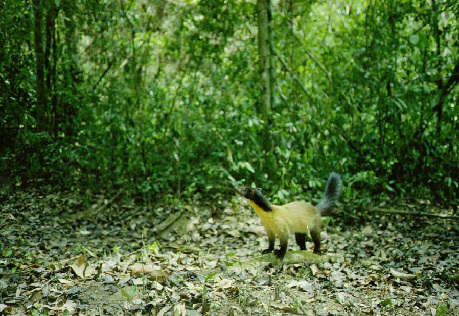 The information compiled covered multiple sites throughout Thailand and was mostly in the form of camera-trap photos, although direct sightings, tracks, or other recorded signs were also taken into account. In addition to compiling information on small carnivores, a number of larger ones (tiger, leopard, clouded leopard) were also included for comparison. Immediate Action Required: Hairy-nosed otter and other otter species, flat-headed cat, jungle cat, fishing cat, dhole, large-spotted civet, Siberian weasel, and otter civet. More Information Needed: Ferret badger, small Indian civet, banded linsang, spotted linsang, binturong, banded civet, Asian golden cat, marbled cat, clouded leopard. No Current Special Needs: Asiatic jackal, Malay weasel, yellow-bellied weasel, stripe-backed weasel, yellow-throated marten, hog badger, large Indian civet, common palm civet, masked palm civet, small-toothed palm civet, small Asian mongoose, crab-eating mongoose, leopard cat. The group also discussed future goals, standardized methods, and to stress the importance of effective law enforcement, trade monitoring, and further surveys and information exchanges. This was in addition to highlighting gaps in basic ecological and phylogenetic knowledge for many species. Discussion was lively and the data set was 'quite impressive'. Research efforts are much more effective when there is a comprehensive plan that all researchers are aware of and in agreement with. This workshop should provide a baseline reference for future research as well as prevent potentially repetitive and fragmented efforts.